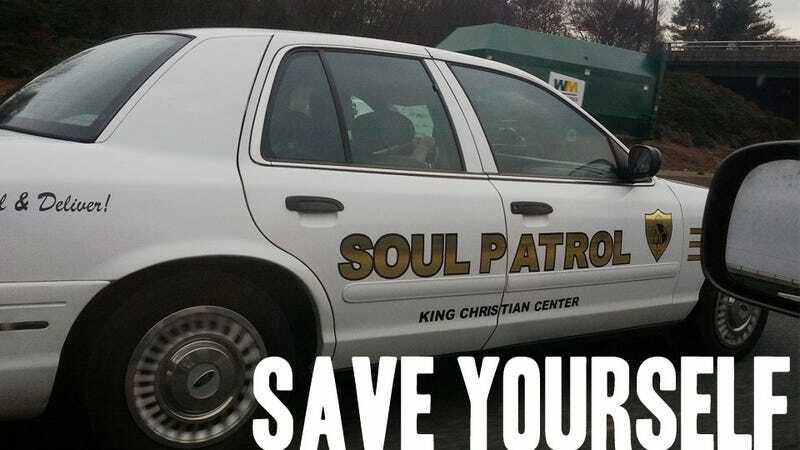 Recently, this Reddit thread had the picture you see above of a very official-looking Crown Vic bearing the "Soul Patrol" livery, and operating under the jurisdiction of the "King Christian Center." A bit more research revealed that a fortunate convergence of recently-discovered legal loopholes and new technological developments are causing many churches and other religious institutions to maintain small fleets of patrol cars, with equipment designed to read and process a given driver's spiritual bent and intensity. If a driver does not meet a given religious institution's standards within a certain radius around their church, the driver may be pulled over and fined (though that fine is technically a "donation"). Now, regardless how you feel about this, in the immediate term heathens such as myself need a way to simply get through these areas without constant harassment by Soul Patrol cars, and, luckily, I've found a way: the Spiritizer 2100. We don't normally do product endorsements here on Jalopnik, but this thing has really been a life saver. I'm not even entirely sure the Spiritizers are still even made; mine is from the late 70s, when these were used for cult infiltration. Essentially, the Spiritizer plays back and broadcasts recorded brainwaves from highly pious and spiritual people, switchable between Christian, Islamic, and Judaic, with some degree of analog intensity control. The resulting pulses are strong enough to mask a driver's own electrochemical spirituality signals, letting you cast a "false positive" to any nearby detectors. Ever since I got my Spiritizer on eBay, none of the Soul Patrol cars have even slowed down when they pass me on the freeway. It's even strong enough to mask my ingrained Judaism with Evangelical Christian signals. Seriously, any fellow nonbeliever in an area with heavy Soul Patrols should absolutely look into finding one of these babies. If you were capable, you'd thank God you did.